NEW YORK, New York — Still less than two years old, the Hayastan All-Armenian Fund’s Greek affiliate is already hard at work raising funds for much-needed initiatives in Armenia and Artsakh. One hundred and thirty eager schoolchildren in Vanadzor, located in the center of Armenia’s Lori Region, now have ample furniture and a revamped playground—replete with slides and swings—at their disposal. While infrastructure-development remains a vital area of focus, the Hayastan All-Armenian Fund is determinedly undertaking educational initiatives throughout Armenia and Artsakh. Still another project implemented by the Greek affiliate in Vanadzor, the establishment of a computer classroom at the Vanadzor Orphanage will enable the institution’s disadvantaged children to build self-confidence and acquire the necessary knowledge and computer skills to have a competitive edge when they eventually enter the labor market, explains Arshaluys Harutyunyan, director of the orphanage. Currently, the institution shelters 102 children and youths, many of whom have lost their parents while others come from socially vulnerable families. Sixty of the home’s residents attend public schools and 20 are students at colleges or universities. The computer lab was created by renovating an existing room and providing it with furniture and state-of-the art equipment, including ten late-model computers, a combination printer/scanner/fax machine, educational DVDs, and a local network which, in the future, will allow access to the Internet. Moreover, the Instigate IT company has agreed to offer free computer classes on the site and train an instructor. The computer classroom is the Hayastan All-Armenian Fund’s second project to be implemented at the Vanadzor Orphanage. 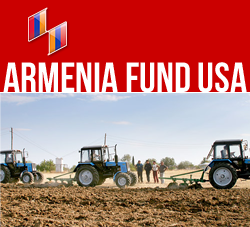 Last year, the Fund renovated the institution’s ten restrooms, with the financial support of the Armenia Fund U.S. Western Region.